You can’t fake passion, fact. The difference between someone getting through interview stages or not usually boils down to the energy in the room. Passion appears to be an overused term now on LinkedIn profiles and CVs, but the real deal is easy to spot. There’s something very tangible when someone loves their field, it’s infectious to those on the receiving end. You want the candidate to be successful, you want to help them achieve that success, and you fight their corner to help them get the opportunity they deserve. This is their authentic self and you know they have a good chance at succeeding if they put the effort in. Last week I had the pleasure of judging the North West finalists of Young Enterprise NI “Overall Entrepreneur of the Future” and “Overall Company”. YENI ignited the first entrepreneurial spark in me at that age, so it’s great to be volunteering with them now. They are doing a fantastic job preparing young people for business. All the teams were a credit to themselves, their parents and their schools and should be proud of what they’ve achieved in a short time. They created products and profits that would put most adults to shame. Not surprisingly, the individuals and teams who displayed the most passion for what they were doing definitely came out on top overall. Winners won’t be announced until April so I can’t say any more. I often see the same thing interviewing job candidates. There can be very little separating two candidates apart from the undeniable energy present when one is truly passionate about their work, their eyes light up and words come flowing out with a magical force that commands attention. When times get tough in jobs, as they inevitably do, it’s this passion that will keep people going through the hard times. It’s much easier to give up on something that doesn’t make your heart sing. Make sure you have passion for whatever you decide to do, it will be a long hard career path otherwise. 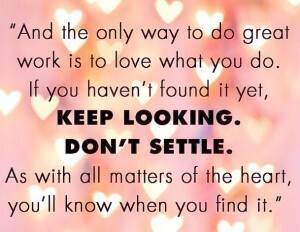 If you haven’t found it, don’t settle as Steve Jobs famously said, keep looking, move on and you will find it eventually. 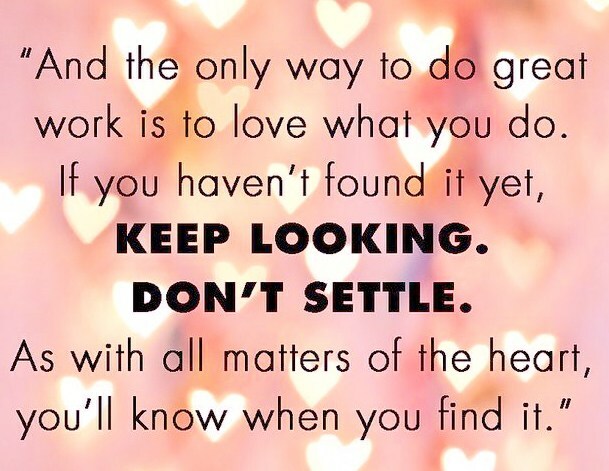 If you’re in the wrong job and need advice get in touch, life’s too short to be doing something you don’t love and you’ll never be truly successful until you find your passion. If you know you’ve found it but you’re still unhappy, the company culture or management style could be a mismatch, in that case look for somewhere you fit into, rather than change yourself to the point of misery. Keep looking, move forward, be true to yourself.